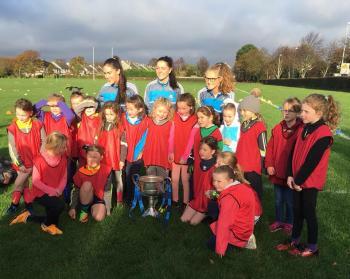 Yesterday the U8s were just one of a number of teams delighted to welcome some of our senior club and Dublin players Sinead Goldrick, Amy Connolly and Hannah O’Neill to the academy where they gave all the girls inspiration and words of encouragement. They brought the Brendan Martin trophy with them and they joined in all of the training. The U8s had great fun like all the other teams dressing up in super Halloween costumes and playing a range of fun spooky games. Even our coaching squad got wrapped up like Egyptian mummies! It was another brilliant academy and well done to all involved in organising!